The door control receiver is used to receive electrical waves relating to the entry functions of the smart key system. 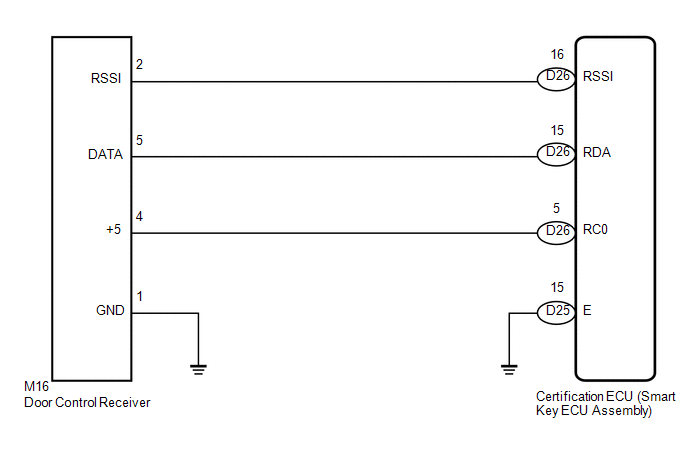 The certification ECU (smart key ECU assembly) decodes the requested smart key system operation by identifying a key code based on the radio waves received via the door control receiver. The door control receiver receives a signal from the door control transmitter and sends signals to the main body ECU (driver side junction block assembly) through the certification ECU (smart key ECU assembly). The certification ECU (smart key ECU assembly) then sends a command, according to the requested operation, to each ECU (ex. if door lock operation is requested, the certification ECU (smart key ECU assembly) sends a door lock command to the main body ECU (driver side junction block assembly)). Short in RDA or RSSI to ground between the certification ECU (smart key ECU assembly) and the door control receiver. 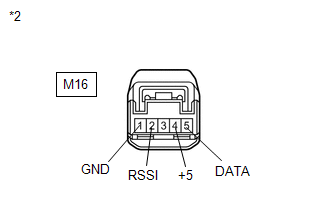 Short in RDA or RSSI to ground when RC0 (5 V) output from the ECU is off. When replacing or inspecting the door control receiver and wire harness, do not change the position or length of the wire harness. If the wire harness is too close to the door control receiver, entry and wireless function performance may be affected. Before performing the inspection, check that there are no problems related to the CAN communication system and LIN communication system. 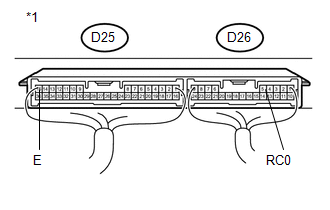 (a) Disconnect the D25 and D26 certification ECU (smart key ECU assembly) connectors. (b) Disconnect the M16 door control receiver connector. 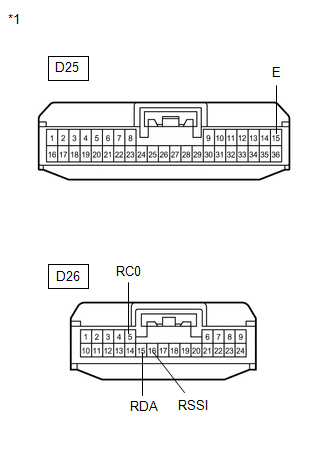 (a) Reconnect the D25 and D26 certification ECU (smart key ECU assembly) connectors. (a) Temporarily replace the door control receiver with a new one (See page ). DTC B1242 is not output.